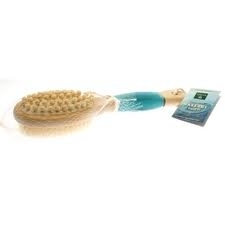 Soothe, stimulate and exfoliate with this dual function massage brush. A cushion of mini massage balls relaxes tense muscles and stirs up circulation, while a plush matting of semi-stiff natural bristles gives skin a good buffing. Used for Garshana (dry brush massage) as part of your daily Ayurvedic routine. i give them to some of my practice consultation clients as a thank you. I bought a cheapy one at Walmart but the one I got from you feels so much better! I've been searching for the perfect body massage brush and I found it. It's wonderful!